The word 'champion' is frequently used in the context of change management. 'Champions' are sought to implement change program, ideas are 'championed' against rival concepts. 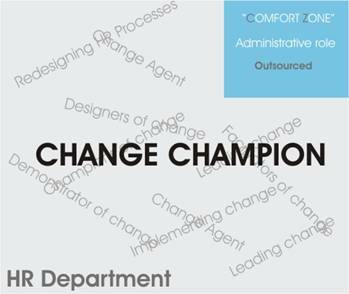 HR professionals have the major role to play in managing change by being and developing change champions within the organization. But what makes a champion of change? The most cursory study of mediaeval literature makes clear the scarcity of great champions, and the many sacrifices which the role entails. Anyone planning to do battle in the corporate lists should be fully aware of what the job means before volunteering to break a lance in a strategic cause. Peter Drucker, involved in hundreds of team or organization changes observed that most successful – and certainly all major ones – were driven by “monomaniacs with a mission”. According to Mercer’s European HR Transformation Study, more than 70% of European firms are transforming their HR function or have already done so. Changing organisation and business requirements are the principal drivers of the HR transformation process, which primarily seeks to align the HR function with business needs and increase its ability to support the overall management of people and improve business effectiveness. Resistance to change is a favourite topic of discussion in HR circles these days. Behavioural scientists, say that Indian corporations find it fashionable to blame it all on the rank-and-file, but that is just a myth. 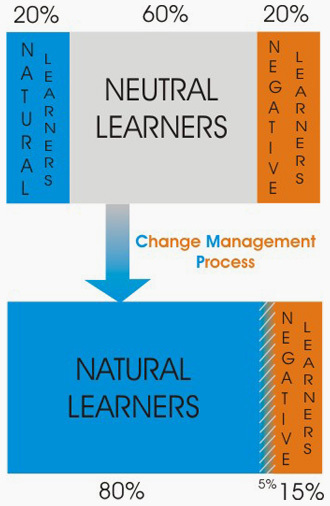 The 3-N model classifies employees in terms of their learning orientation into three categories: natural learners (20 per cent), neutral learners (60 per cent) and negative learners and 20 per cent). According to the 3-N model, the proportion of these three categories remains stable across organisations. Through sustained efforts in creating intrinsic interest in their work profile, it is possible to convert neutral learners into natural learners. Even negative learners - at least a majority of them - are negative only with the kind of work that have been assigned to them but would welcome change readily if the benefits are communicated to them properly. In the role of Scout, the HR professional is literally scouting the landscape and internal business environment to identify opportunities, threats, challenges, weaknesses, and strengths. As every savvy HR professional knows, being in a staff position presents the challenge of influencing others without having direct authority over them. In the role of Chess Master, the HR professional is engaging in a constant evaluation of all the “players” on the “chess board”, determining how best to influence, coach, and leverage change champions who have the authority to make change happen. The HR professional is uniquely positioned to advise and educate executives and managers on how best to approach and manage change efforts. They can literally provide a “roadmap” for change that encompasses all the critical elements of a successful change initiative. This roadmap should contain the necessary tools and techniques to navigate successfully through re-engineering efforts, mergers, acquisitions, divestitures, etc. Many changes initiatives require HR professionals to re-think the design of systems and processes for managing human performance. For HR Professionals, the transformation is a continuous process with no real ‘end,’ as the challenges of business alignment are ongoing.